The anthology includes seventeen stories plus ancillary material. As a whole it is worth tracking down and reading, but the following are of particular note. A short but punchy foreword by SF enthusiast LeVar Burton of Roots, The Reading Rainbow, Star Trek: The Next Generation, and the podcast LeVar Burton Reads. It occurs to me I’ve been following Burton’s work since the 1970s, which has to be at least a decade ago; it’s probably time I stopped thinking of him as a promising newcomer and started thinking of him as a reliable veteran. Cab driver Tavi makes a living shuttling alien tourists around New York. An alien passenger commits suicide and Tavi connives at a coverup. Only problem: the cover-up wasn’t successful and the trail ends at Tavi…. 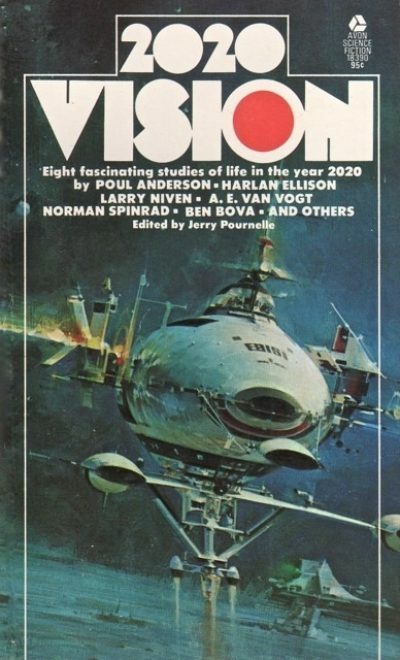 This story was oddly reminiscent of Norman Spinrad’s 1973 Nebula nominee “A Thing of Beauty”1. Both stories involve tourism and the selling of America to the highest bidder. Spinrad’s piece played off American outrage at the mere idea Americans might one day become a second-rate power. Buckell is more interested in the predatory nature of most (if not all) tourism. Two mighty empires, one led by a mad man and one by an aggressive warlord. War was inevitable and yet war never came. Thanks to two minor functionaries pursuing a very personal agenda. Well, this is happy-ish. Maybe the lovers found each other again. A lot of people got to die much later than they might otherwise have died. In the grander scheme of things, the world is subject to the violent whims of the powerful; best to focus on the occasional strawberry and not the tiger. Like the Buckell, the story deals with how wealthy nations offshore even the most personal services. The Djinn freed Nuhu’s people. It provides the humans whatever they want; all it asks is the occasional child. Why then is Nuhu so unwilling to live up to such a reasonable bargain? And how can he possibly escape it? A woman discovers the world’s true masters. This revelation is uncomfortable enough. Her lover unluckily catches their attention and reveals, if only for a moment. This is what happens when the powerless inconvenience the powerful, even if slightly. Faced with an unstoppable invasion by a technologically superior society that is incidentally spreading epidemic disease, the few men who survive … submit. The women do not. The parallels with the 16th century invasions of the New World cannot be coincidental. Despite the presence of functional magic, the invaders hold the upper hand. That’s why the protagonist embraces the horrific choices that she does. Three generations of women met the eerie woman of the sea. Only one of them could join the eldritch being. I occasionally wonder what Lovecraft might have been like had he been xenophilic rather than extraordinarily xenophobic. This tale suggests an answer. It skirts the border between horror and romance (or at least irresistible attraction). A retelling of the Emperor’s New Clothes, even more pointed than the original. Someone murdered and then disappeared the ruler of Opike. The smart money says it was the ruler of neighboring Domani. The Domani ruler knows he didn’t do it. He must prove his innocence or force his nation to choose between handing him over the enemy or facing open war. In many ways this is framed in supernatural horror terms, but it’s definitely SFnal. Biology can be terrible. Suddenly, magically, free of weight she always saw as excess, a woman realizes once it’s gone that she misses her old tummy. What she fails to ponder before heading out to retrieve her missing mass is whether it misses her. It cannot all be grim examinations of the human condition. This, for example, is a funny, surreal examination of the human condition. 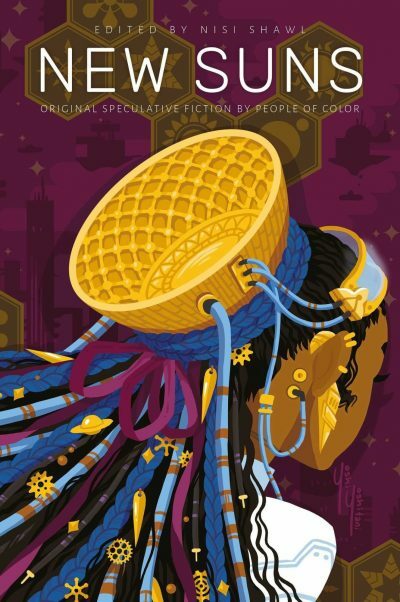 New Suns: Original Speculative Fiction by People of Color is available here (Amazon), here (Amazon.ca) and here (Chapters-Indigo). 1: Since Buckell chose for reasons unexplained to be born well after the Spinrad was published, the parallels are undoubtedly coincidental. in just nine months. “A Thing of Beauty” is one of the works featured. I should save this for the 2020 Vision review, but ... I am extraordinarily positive that I've seen that cover painting before, and not on this book. There's a good chance you have: That guy's paintings of spacecraft have a history of being reused on multiple book covers, (and are also found in various collections of SF art). I bet I could write something dismayingly reminiscent of H. G. Wells. But don't worry, I won't.